Tuition breaks with riding lessons and vacations offering riding coaching for all levels including learn to ride courses for novice riders. Horseback riding tuition holidays in the UK, abroad in Europe and Worldwide. 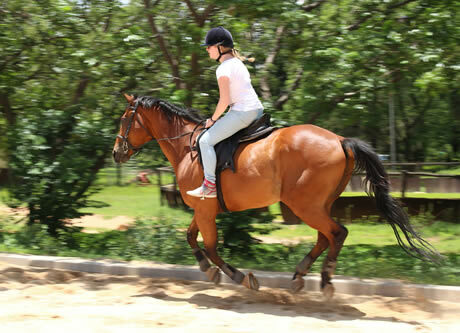 Equestrian centre offering horse holidays and training camps for experienced riders, 2-4-day, weekend and long weekend courses for horses and riders of all levels. Also special courses such as 'confident rider' and 'horse massage'. Riding lessons for adults and children, clinics with top trainers, BHS training, coaching for young riders, show jumping and dressage training and convenient self-catering accommodation for riding holidays. A selection of Eurocamp parcs chosen as ideal for a horse riding break, with numerous parcs with riding facilities available across Europe. Parcs listed in a variety of locations from the sunny South of France to the mountains of Switzerland. One week learn to ride holidays for aspiring riders over 16 years old, or 3-night mini-breaks. Including and introduction to horse riding and an introduction to horse care and stable management for those considering getting their own horse. Offering a special 2-day learn-to-ride course (where you'll learn not just how to ride but also horse handling and care, grooming and tacking up); as well as riding camps for young people and new riders. Horse riding weekends and mid-week breaks in Devon, with BHS qualified instruction. Training in Ireland for riding, polo, show jumping, cross-country jumping and dressage. Riding lessons for all levels, including beginners over 20; 1â€“2-two week intensive training breaks to learn horse riding. Tailored riding tuition holidays for all levels form complete beginner to experienced rider. BHS approved training centre for career students who wish to take BHS qualifications; also offering riding lessons, hacking and riding holidays. Travel-quest's horse riding tuition holidays section lists pony and horseback riding holidays, residential courses, weekends, short breaks and training camps offering horse riding instruction, coaching and tuition – from learn to ride courses for novice riders, to improvers courses and training, and coaching for experienced riders. These types of holidays and courses will usually be based at a riding stable or equestrian centre and the training will take place in an indoor school, an outdoor manege or arena, or on the hoof out on bridleways, riding trails, in fields and in the countryside. They may be offering lessons in the traditional English riding style or in Western horseback riding. The main focus of the holiday or course should be the riding instruction and that should be the predominant activity offered. See our equestrian and horseriding index for separate sections covering other types of riding holiday, including trail riding trips, day hacking, and horse or pony trekking from a fixed base. Why not learn to ride and discover horse riding as a day activity before committing to a longer holiday or course? A variety of options are available including: short (half-hour and hour long) lessons for any level of experience (beginner, intermediate or advanced), full-day horse riding and care experiences, adult and kids sessions, half-day beach riding, and a pony club riding experience for children. The travel-quest horse riding lessons section lists holidays, short breaks, weekends and vacations offering horseback riding lessons and tuition; learn to ride courses and workshops for all levels of rider.